This post may contain affiliate links. Please see our disclosure in the sidebar. I have a bit of a confession. I think I have as much fun with slime as my kids do. I don’t know what it is, but it’s very relaxing to play with it, squishing it between your fingers and just letting it run through them. Molly and I have been waiting to do this one for awhile. We decided to make an ocean of slime with blue glitter glue. We wanted a lot of slime, so we used two bottles. 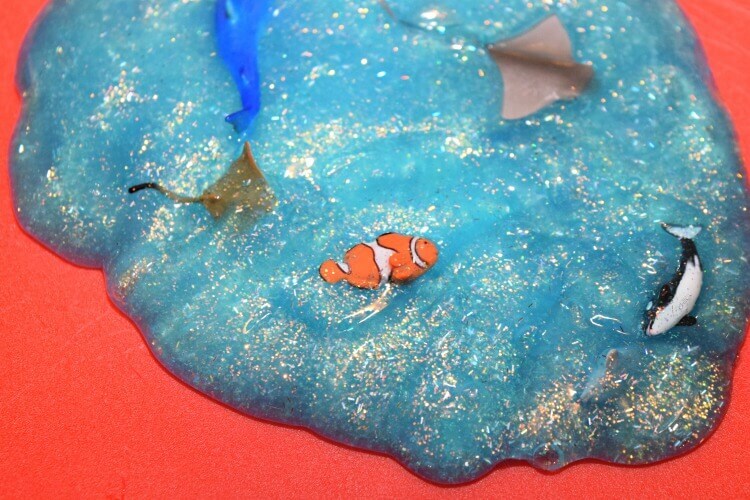 Then, after the slime was set, we add a bunch of sea life. I had this tiny little packet of tiny animals, but we wanted more, so we broke out some sea life from our Light Up Aquarium Mason Jars and added them into the slime as well. These are very similar or the exact same to the animals we used. For this recipe, I used liquid starch. Sometimes I use Borax and sometimes liquid starch. I find the liquid starch method is sometimes stickier, but it’s stretchier, too. In a large bowl pour out both glue bottles. Fill the glue bottles up with warm water and pour into the bowl. 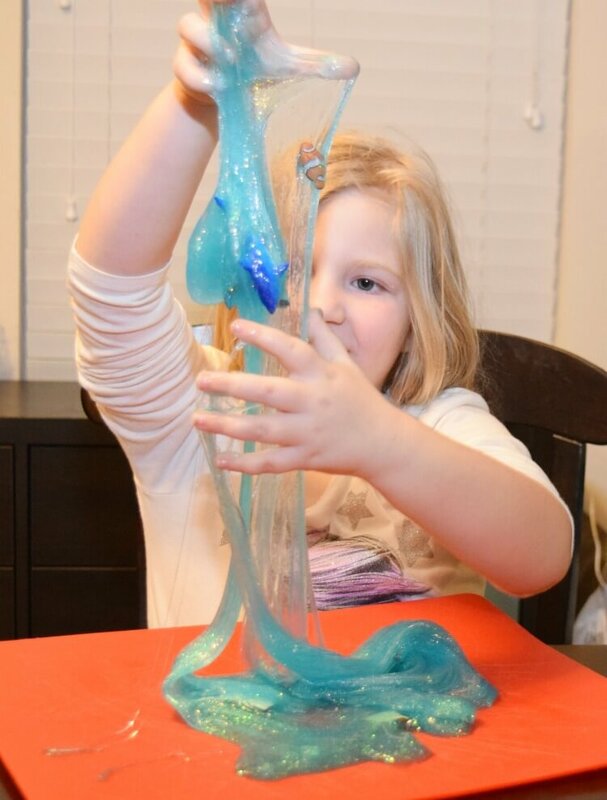 Stir until the ingredients are well combined and the glue turns into stretch slime. Then pull the slime up and knead it in your hands to remove excess water. 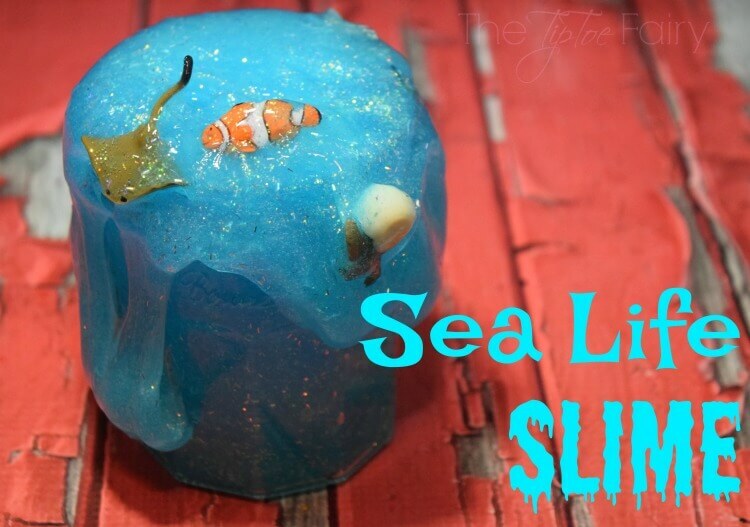 Lay the slime onto a plastic mat or cutting board and fold in the sea life creatures. Store in a plastic ziplock bag for storage. 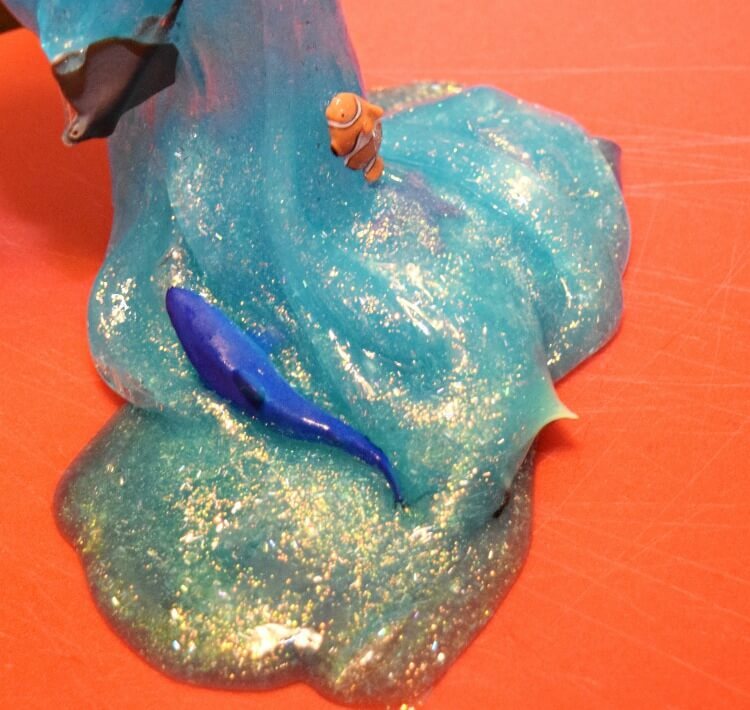 Oh I think I see Nemo hiding in our slime! My favorites were the stingrays. Molly was always hunting for those evil sharks. 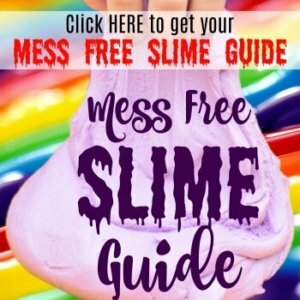 What kind of slime have you made lately?